Lately I struggled with finding a way to deselect “automatically detect settings” in IE for all users of a customer. There are no GPO settings for this and the GPP IE settings doesn’t allow to set this for any IE versions before IE10 and the customer needs IE9 for compatibility issues with their SharePoint sites. After much searching I found a way to set this using GPP to set a registry setting. Sometimes you want to output some text and append an variable. Problem is that write-output usually performs a linebrak when appending. There are two ways you can solve this. One is to append the text to the variable before doing write-output. Second is to put the variable inside the quotation marks. If you have DFS replication errors on one or more domain controllers, first find out witch domain controller that has the error. log on to all your domain controllers and check the Event log -> Applications and Services Logs -> DFS Replication and look for Warnings. 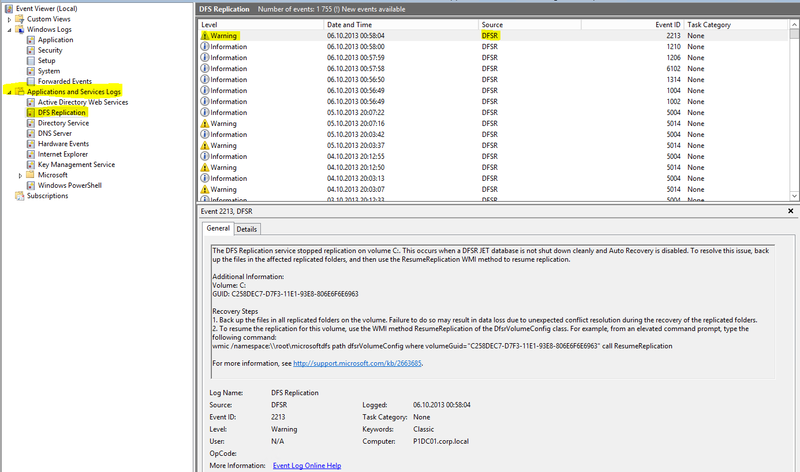 In this example the domain controller had an dirty shutdown based on power failure. * Inside diskpart write “list disk” and identify the number for the pendrive. * Enter the following command, in the example below the pendrive is disk 1 in diskpart. Then you should be all set, remember the boot order in BIOS when you want to boot from the pendrive.